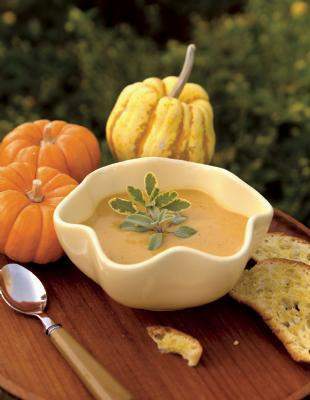 Puréed pumpkin flavored with fresh sage makes a rich and creamy soup. Pumpkins, which are members of the gourd family, along with watermelon and squash, are an American pastime each fall. In fact, according to the U.S. Census Bureau, 1.1 billion pounds of pumpkins were produced in this country in 2008, at a value around $141 million. While most families plan on getting a pumpkin this season, they are not always sure how to select a good one, or what to do once they have it home. b Selecting. To pick a good pumpkin, opt for one that is mature, feels firm, and has a rich orange color. Avoid ones that have scars and cracks. You can check the firmness by pushing on it with your fingernail. If it is mature, it should not scratch with the pressure. b Storing. Once you get the pumpkin home, you can store it for at least a month in a cool, dry place. If you want it to keep longer, you can take the pumpkin flesh out of its skin; it can then be frozen, dried or canned. b Using. There are a variety of uses for pumpkins. Many people opt to carve them into jack-o-lanterns. Others may decide to cook with them, which is a good option because they are loaded with antioxidants, beta-carotene, and vitamin A. They also provide fiber, potassium and calcium. Pumpkins can be baked whole in the oven. Just be sure to poke holes in it first and then, when it’s finished, remove the skin, seeds and membrane. The seeds can be roasted in the oven by tossing with some oil and laying a single layer on a baking sheet for about 12-15 minutes at 250 degrees. Pumpkin can also be used to make pies, pancakes, muffins, soups and a variety of other tasty recipes. A quick online search can net a wide array of pumpkin recipes. If you want to carve your pumpkin but still get some nutritional benefits, either carve it and toast the seeds, or opt to decorate it with non-toxic paint so you can still bake it afterward. b Discarding. If you go the route of creating a jack-o-lantern, this season, you may be wondering what to do with it once the festivities have moved on. Composting it makes a great option if you or someone you know has a garden. You can also check into donating it to local animal farms, or see if your city is collecting them for recycling purposes. “No autumn would be complete without the great pumpkin,” adds Kuropatwa. Preheat the oven to 400 F. Cut the pumpkin in half, and remove the seeds. Place the halves, cut-side up on a large baking sheet, and drizzle each half with a tablespoon of oil. Place in the oven and roast until a knife easily cuts through the flesh of the pumpkin, about 45 minutes to an hour. Let the pumpkin cool. When cool enough to handle, scrape the flesh from the skin into the bowl of a food processor. Purée the pumpkin into a thick paste and place 1½ cups of the purée into a saucepan along with the salt and nutmeg. Cook the purée over medium heat until most of the water in the purée has evaporated and the pumpkin appears dry. Gradually add a cup of the flour, stirring constantly. Continue cooking until the mixture forms a ball (5 to 10 minutes). Remove the pan from the heat. In a small bowl, beat the egg with a fork until scrambled, and add it into the pumpkin mixture, along with 1¾ cups of the grated cheese. Mix to combine. Turn the dough out onto a lightly floured board and knead it a few times and form into a ball. Cover the dough with a bowl and allow to rest for about 30 minutes. After the dough has rested, knead it, adding more flour if necessary, until the dough feels smooth and not too sticky. Form a ball and cut the dough into 4-ounce pieces. Keeping the remaining dough covered under the bowl, roll one piece into a ¼ to ½ inch-thick rope, dusting the board with additional flour as necessary to prevent sticking. Cut the rope into 1-inch-long pieces, using a knife dipped in flour. Dust a baking sheet with a small amount of flour, and gently place the cut gnocchi on the sheet in a single layer. Set aside until ready to cook. Alternately, the gnocchi can be refrigerated (covered) for up to a day, or frozen on the sheet. If freezing, after the gnocchi have hardened, (about 2 hours) they should be loosened from the tray using a metal spatula and placed in a plastic bag. They can then be stored in the freezer for up to 3 months. Melt the butter in a large skillet over medium-high heat. Add the sage and cook for 2 minutes, until the butter starts to brown. Set aside. Place a 4-quart pot of water on the stove. Salt the water and bring it to a boil over high heat. Once the water has come to a boil, add ¼ of the gnocchi and cook until tender (2-3 minutes). Using a slotted spoon, remove the cooked gnocchi from the pot, and place into the skillet with the sauce. Repeat until the remaining gnocchi are cooked. When finished, quickly sauté the gnocchi and sauce for 1 to 2 minutes over medium-high heat, tossing to coat the gnocchi with the sauce. Remove from the heat, and sprinkle with the remaining ¼ cup cheese, and serve.